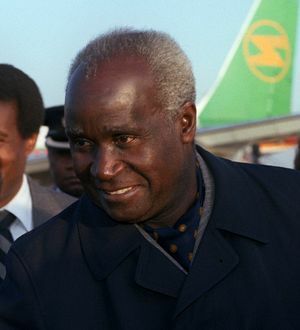 Kenneth David Kaunda (born 28 April 1924), also known as KK, served as the first President of Zambia, from 1964 to 1991. Kaunda is the youngest of eight children born to an ordained Church of Scotland missionary and teacher. He followed his father's steps in becoming a teacher. He was at the forefront of the struggle for independence from British rule. Dissatisfied with Nkumbula's leadership of the Northern Rhodesian African National Congress, he broke away and founded the Zambian African National Congress, later becoming the head of the United National Independence Party. He was the first President of the independent Zambia. In 1972 all political parties except UNIP were banned. At the same time, Kaunda oversaw the acquisition of majority stakes in key foreign-owned companies. The oil crisis of 1973 and a slump in export revenues put Zambia in a state of economic crisis. International pressure forced Kaunda to change the rules that had kept him in power. Multi-party elections took place in 1991, in which Frederick Chiluba, the leader of the Movement for Multiparty Democracy, ousted Kaunda. Kaunda was briefly stripped of Zambian citizenship in 1999 but the decision was overturned the following year. 2.3 One-party state and "African socialism"
Kaunda is the youngest of eight children. He was born at Lubwa Mission in Chinsali, Northern Province of Northern Rhodesia, now Zambia. His father was the Reverend David Kaunda, an ordained Church of Scotland missionary and teacher, who was born in Nyasaland (now Malawi) and had moved to Chinsali to work at Lubwa Mission. He attended Munali Training Centre in Lusaka (August 1941 – 1943). Kaunda was a teacher at the Upper Primary School and Boarding Master at Lubwa and then Headmaster at Lubwa from 1943 to 1945. He was for a time working at the Salisbury and Bindura Mine. In early 1948, he became a teacher in Mufulira for the United Missions to the Copperbelt (UMCB). He was then assistant at an African Welfare Centre and Boarding Master of a Mine School in Mufulira. In this period, he was leading a Pathfinder Scout Group and was Choirmaster at a Church of Central Africa Congregation. He was also for a time Vice-Secretary of the Nchanga Branch of Congress. In April 1949, Kaunda returned to Lubwa to become a part-time teacher, but resigned got in 1951. In that year he became Organising Secretary of Northern Province's Northern Rhodesian African National Congress. On 11 November 1953 he moved to Lusaka to take up the post of Secretary General of the ANC, under the presidency of Harry Nkumbula. The combined efforts of Kaunda and Nkumbula failed to mobilise native African peoples against the European-dominated Federation of Rhodesia and Nyasaland. In 1955 Kaunda and Nkumbula were imprisoned for two months with hard labour for distributing subversive literature; such imprisonment and other forms of harassment were normal rites of passage for African nationalist leaders. The experience of imprisonment had a radicalising impact on Kaunda. The two leaders drifted apart as Nkumbula became increasingly influenced by white liberals and was seen as being willing to compromise on the issue of black majority rule, waiting until most of the indigenous population was responsibly educated before extending the franchise. The franchise was to be determined by existing property and literacy qualifications, dropping race altogether. Nkumbula's allegedly autocratic leadership of the ANC eventually resulted in a split. Kaunda broke from the ANC and formed the Zambian African National Congress (ZANC) in October 1958. ZANC was banned in March 1959. In June Kaunda was sentenced to nine months' imprisonment, which he spent first in Lusaka, then in Salisbury. While Kaunda was in prison, Mainza Chona and other nationalists broke away from the ANC and, in October 1959, Chona became the first president of the United National Independence Party (UNIP), the successor to ZANC. However, Chona did not see himself as the party's main founder. When Kaunda was released from prison in January 1960 he was elected President of UNIP. In 1960 he visited Martin Luther King Jr. in Atlanta and afterwards, in July 1961, Kaunda organised a civil disobedience campaign in Northern Province, the so-called Cha-cha-cha campaign, which consisted largely of arson and obstructing significant roads. Kaunda subsequently ran as a UNIP candidate during the 1962 elections. This resulted in a UNIP–ANC Coalition Government, with Kaunda as Minister of Local Government and Social Welfare. In January 1964, UNIP won the next major elections, defeating their ANC rivals and securing Kaunda's position as prime minister. On 24 October 1964 he became the first President of an independent Zambia, appointing Reuben Kamanga as his Vice-President. At the time of its independence, Zambia's modernisation process was far from complete. It had just 109 university graduates and less than 0.5% of the population was estimated to have completed primary education. The nation's educational system was one of the most poorly developed in all of Britain's former colonies. Because of this, Zambia had to invest heavily in education at all levels. Kaunda instituted a policy where all children, irrespective of their parents' ability to pay, were given free exercise books, pens and pencils. The parents' main responsibility was to buy uniforms, pay a token "school fee" and ensure that the children attended school. This approach meant that the best pupils were promoted to achieve their best results, all the way from primary school to university level. Not every child could go to secondary school, for example, but those who did were well educated. The University of Zambia was opened in Lusaka in 1966, after Zambians all over the country had been encouraged to donate whatever they could afford towards its construction. Kaunda was appointed Chancellor and officiated at the first graduation ceremony in 1969. The main campus was situated on the Great East Road, while the medical campus was located at Ridgeway near the University Teaching Hospital. In 1979 another campus was established at the Zambia Institute of Technology in Kitwe. In 1988 the Kitwe campus was upgraded and renamed the Copperbelt University, offering business studies, industrial studies and environmental studies. Other tertiary-level institutions established during Kaunda's era were vocationally focused and fell under the aegis of the Department of Technical Education and Vocational Training. They include the Evelyn Hone College of Applied Arts and Commerce and the Natural Resources Development College (both in Lusaka), the Northern Technical College at Ndola, the Livingstone Trades Training Institute in Livingstone, and teacher-training colleges. At independence Kaunda's government inherited a country with an economy that was completely under the control of foreigners. For example, the British South Africa Company (founded by the British imperialist Cecil Rhodes) still retained commercial assets and mineral rights that it had acquired from a concession signed with the Litunga of Bulozi in 1890. Only by threatening to expropriate it on the eve of independence did Kaunda manage to get favourable concessions from the BSAC. Deciding on a planned economy, Zambia instituted a program of national development, under the direction of the National Commission for Development Planning, which instituted a "Transitional Development Plan" and the "First National Development Plan". These two operations, which attempted to secure major investment in infrastructure and manufacturing sectors, were generally regarded as successful. A major change in the structure of Zambia's economy came with the Mulungushi Reforms of April 1968: Kaunda declared his intention to acquire an equity holding (usually 51% or more) in a number of key foreign-owned firms, to be controlled by his Industrial Development Corporation (INDECO). By January 1970, Zambia had acquired majority holding in the Zambian operations of the two major foreign mining interests, the Anglo American Corporation and the Rhodesian Selection Trust (RST); the two became the Nchanga Consolidated Copper Mines (NCCM) and Roan Consolidated Mines (RCM), respectively. Kaunda also announced the creation of a new parastatal body, the Mining Development Corporation (MINDECO), while a Finance and Development Corporation (FINDECO) allowed the Zambian government to gain control of insurance companies and building societies. Major foreign-owned banks, such as Barclays, Standard Chartered and Grindlays Bank, successfully resisted takeover. In 1971, INDECO, MINDECO, and FINDECO were brought together under an omnibus parastatal, the Zambia Industrial and Mining Corporation (ZIMCO), to create one of the largest companies in sub-Saharan Africa, with Francis Kaunda as chairman of the board. The management contracts under which day-to-day operations of the mines had been carried out by Anglo American and RST were terminated in 1973. In 1982, NCCM and RCM were merged into the giant Zambia Consolidated Copper Mines Ltd (ZCCM). Unfortunately this nationalisation policy was ill-timed. In 1973, the massive increase in the price of oil was followed by a slump in copper prices and a diminution of export earnings. In early 1973, the price of copper accounted for 95% of all export earnings; this had halved in value on the world market by early 1975. By 1976, Zambia had a balance-of-payments crisis, and rapidly fell into debt with the International Monetary Fund (IMF). The Third National Development Plan had to be abandoned as crisis management replaced long-term planning. By the mid-1980s, Zambia had one of the highest debts of any nation on the globe, relative to its gross domestic product (GDP). The IMF insisted that the Zambian government should focus on stabilising the economy and restructuring it to reduce dependence on copper. The proposed measures included the ending of price controls, devaluation of the kwacha, reining in of government spending, cancellation of subsidies on food and fertiliser, and increased prices for farm produce. Kaunda's removal of food subsidies caused the prices of basic foodstuffs to skyrocket, sparking riots and disorder. In desperation, Kaunda attempted to sever his ties with the IMF in May 1987 and introduce a New Economic Recovery Programme in 1988. However, this was not ultimately successful and he eventually moved toward a new understanding with the IMF in 1989. In 1990 Kaunda was forced to make major policy shifts; he announced the intention to partially privatise the parastatals. However, these changes were too little and came too late to prevent his fall from power as a result of Zambia's economic woes. One-party state and "African socialism"
In the wake of the Lumpa Uprising, Kaunda proclaimed a state of emergency, banning the Lumpa Church, which he considered a major source of opposition because it refused to allow its members to participate in compulsory voting. This created animosity between the Church and UNIP, resulting in some low-level conflict which claimed numerous lives. Kaunda tried to mediate the differences between the Church, local authorities and UNIP party members but was eventually unable to control party cadres in the North. From 1964 onwards, Kaunda's government developed clearly authoritarian characteristics. Becoming increasingly intolerant of opposition, Kaunda banned all parties except UNIP, following violence during the 1968 elections. However, in early 1972 he faced a new threat in the form of Simon Kapwepwe's decision to leave UNIP and found a rival party, the United Progressive Party, which Kaunda immediately attempted to suppress. Next, he appointed the Chona Commission, which was set up under the chairmanship of Mainza Chona in February 1972. Chona's task was to make recommendations for a new Zambian constitution which would effecively reduce the nation to a one-party state. The commission's terms of reference did not permit it to discuss the possible faults of Kaunda's decision. ANC party members boycotted Chona's efforts and unsuccessfully challenged the constitutional change in the courts. The Chona report was based on four months of public hearings and was submitted in October 1972 as a 'liberal' document. Finally, Kaunda neutralised Nkumbula by getting him to join UNIP and accept the Choma Declaration on 27 June 1973. The new constitution was formally promulgated on 25 August. At the first elections under the new system held that December, Kaunda was the sole candidate. With no more opposition to him, Kaunda allowed the creation of a personality cult. He developed a left nationalist-socialist ideology, called Zambian Humanism. This was based on a combination of mid-20th-century ideas of central planning/state control and what he considered basic African values: mutual aid, trust and loyalty to the community. Similar forms of African socialism were introduced inter alia in Ghana by Kwame Nkrumah ("Consciencism") and Tanzania by Julius Nyerere ("Ujamaa"), while in Zaire, President Mobutu Sese Seko, a much less "benevolent" ruler than Kaunda or Nyerere, was at a loss until he hit on the ideal ideology – 'Mobutuism'. To elaborate his ideology, Kaunda published several books: Humanism in Zambia and a Guide to its Implementation, Parts 1, 2 and 3. Other publications on Zambian Humanism are: Fundamentals of Zambian Humanism, by Timothy Kandeke; Zambian Humanism, religion and social morality, by Cleve Dillion-Malone S.J. and Zambian Humanism: some major spiritual and economic challenges, by Justin B. Zulu. Kaunda on Violence, (US title, The Riddle of Violence), was published in 1980. He is known as "Gandhi of Africa" or "African Gandhi." During his early presidency Kaunda was an outspoken supporter of the anti-apartheid movement and opposed white minority rule in Southern Rhodesia. Although his nationalisation of the copper mining industry in the late 1960s and the volatility of international copper prices contributed to increased economic problems, matters were aggravated by his logistical support for the black nationalist movements in Ian Smith's Rhodesia, South West Africa, Angola, and Mozambique. Kaunda's administration later attempted to serve the role of a mediator between the entrenched white minority and colonial governments and the various guerilla movements which were aimed at overthrowing these respective administrations. Beginning in the early 1970s, he began permitting the most prominent guerilla organisations, such as the Rhodesian ZANU and the African National Congress, to use Zambia as a base for their operations. Former ANC president Oliver Tambo even spent a significant proportion of his 30-year exile living and working in Zambia. Joshua Nkomo, leader of ZAPU, also erected military encampments there. On 26 August 1975, Kaunda acted as mediator along with the Prime Minister of South Africa, B. J. Vorster at Victoria Falls to discuss possibilities for an internal settlement in Southern Rhodesia with Ian Smith and the black nationalists. After the Lancaster House Agreement, Kaunda attempted to seek similar majority rule in South West Africa. He met with P. W. Botha in Botswana to debate this proposal, but apparently failed to make a serious impression. Meanwhile, the anti-white minority insurgency conflicts of southern Africa continued to place a huge economic burden on Zambia as white minority governments were the country's main trading partners. In response, Kaunda negotiated the TAZARA Railway (Tanzam) linking Kapiri Mposhi on the Zambian Copperbelt with Tanzania's port of Dar-es-Salaam on the Indian Ocean. Completed in 1975, this was the only route for bulk trade which did not have to transit white-dominated territories. This precarious situation lasted more than 20 years, until the abolition of apartheid in South Africa. For much of the Cold War Kaunda was a strong supporter of the Non-Aligned Movement. He hosted a NAM summit in Lusaka in 1970 and served as the movement's chairman from 1970 to 1973. He maintained a close friendship with Yugoslavia's long-time leader Josip Broz Tito and is remembered by many Yugoslav officials for weeping openly over the latter's casket in 1980. He even had a special house constructed in Lusaka for Tito's visits to the country. He also visited and welcomed Romania's dictator, Nicolae Ceaușescu in the 1970s. In 1986, the University of Belgrade (Yugoslavia) awarded him an honorary doctorate. Kaunda had frequent but cordial differences with US President Ronald Reagan whom he met 1983 and Margaret Thatcher mainly over what he saw as a blind eye being turned towards South African apartheid. He always maintained warm relations with the People's Republic of China who had provided assistance on many projects in Zambia, including the TAZARA Railway. Prior to the first Gulf War, Kaunda cultivated a friendship with Iraqi strongman Saddam Hussein, with whom he secured oil resources for his nation. He even went so far as to name Zambian streets in Saddam's honour. In August 1989, Farzad Bazoft was detained in Iraq for alleged espionage. He was accompanied by a British nurse, Daphne Parish, who was arrested as well. Bazoft was an Iranian-born freelance journalist attempting to expose Saddam's mass murder of Iraqi Kurds. Bazoft was later tried and condemned to death, but Kaunda managed to negotiate for his female companion's release. Kaunda served as chairman of the Organization of African Unity (OAU) from 1970 to 1973. From 1973 onward, Kaunda's leadership took on more autocratic characteristics. He personally appointed the Central Committee of UNIP, although the process was given a veneer of legitimacy by being "approved" by a National Congress of the party. In theory, Kaunda's nominations could be discarded by Congress, but in practice they were always accepted without modification. The argument used was that "the President knows the people who can work well with him, so if we modify the nominations we will end up with a less effective team". In turn, the Central Committee nominated a sole candidate for the post of president of the party. Of course, since the members of the Central Committee had been nominated by him, Kaunda was always the sole candidate. Constitutionally, whoever was in good standing with the party was at liberty to challenge him, but in practice no one did so because of his charisma and intolerance for dissent. The president of UNIP was the only candidate for president of the republic. After the formalities of nominating him, the rest of the Zambian population was given the opportunity to express approval or disapproval of that candidate by voting either "Yes" or "No". Since the presidential "election" was always accompanied by parliamentary elections, there was great pressure placed on parliamentary candidates to "campaign" for the president's "Yes" vote, in addition to their own campaigns. Parastatal companies (which were controlled through ZIMCO – Zambia Industrial and Mining Corporation) were also under pressure to "campaign" for Kaunda by buying advertising space in the two national newspapers (Times of Zambia and Zambia Daily Mail) exhorting the electorate to give the president a "massive 'Yes' vote". The parliamentary elections were also controlled by Kaunda: the names of candidates had to be submitted to UNIP's Central Committee, which then selected three people to stand for any particular constituency. The Central Committee could veto any candidate for any reason. Using these methods, Kaunda kept any potential rivals at bay by ensuring that they never got into political power. This was the tactic he used when he saw off Nkumbula and Kapwepwe's challenges to his sole candidacy for the 1978 UNIP elections. On that occasion, the UNIP's constitution was "amended" overnight to bring in rules that invalidated the two challengers' nominations: Kapwepwe was told he could not stand because only people who had been members for five years could be nominated to the presidency (he had only rejoined UNIP three years before); Nkumbula was outmaneuvered by introducing a new rule that said each candidate needed the signatures of 200 delegates from each province to back his candidacy. Less creative tactics were used on a third candidate called Chiluwe; he was just beaten up by the UNIP Youth Wing to within an inch of his life. This meant that he was in no state to submit his nomination. Eventually, however, economic troubles and increasing international pressure to bring more democracy to Africa forced Kaunda to change the rules that kept him in power. People who had been afraid to criticise him were now emboldened to challenge his competence. His close friend Julius Nyerere had stepped down from the republican presidency of Tanzania in 1985 and was quietly encouraging Kaunda to follow suit. Pressure for a return to multiparty politics increased and Kaunda voluntarily yielded and called for multiparty elections in 1991, in which the Movement for Multiparty Democracy (MMD) won. One of the issues in the campaign was a plan by Kaunda to turn over one quarter of the nation's land to Maharishi Mahesh Yogi, an Indian guru who promised that he would use it for a network of utopian agricultural enclaves that proponents said would create "heaven on earth". Kaunda was forced in a television interview to deny practising Transcendental Meditation. Kaunda left office with the inauguration of MMD leader Frederick Chiluba as president on 2 November 1991. He was the second mainland African head of state to allow free multiparty elections and to have relinquished power when he lost: the first, Mathieu Kérékou of Benin, had done so in March of that year. After leaving office, Kaunda clashed frequently with Chiluba’s government and the MMD. Chiluba later attempted to deport Kaunda on the grounds that he was a Malawian. The MMD dominated government under the leadership of Chiluba had the constitution amended, barring citizens with foreign parentage from standing for the presidency, to prevent Kaunda from contesting the next elections in 1996. Kaunda retired from politics after he was accusedTemplate:By whom of involvement in the failed 1997 coup attempt. After the coup, on Boxing Day in 1997 he was placed under arrest by Chiluba. However, many officials in the region appealed against this; on New Year's Eve of the same year, he was placed under house arrest until the court date. In 1999 Kaunda was declared stateless by the Ndola High Court in a judgment delivered by Justice Chalendo Sakala. A full transcript of the judgment was published in the Times of Zambia edition of 1 April 1999. Kaunda however successfully challenged this decision in the Supreme Court of Zambia, which declared him to be a Zambian citizen in 2000. After retiring, he has been involved in various charitable organisations. His most notable contribution has been his zeal in the fight against the spread of HIV/AIDS. One of Kaunda's children was claimed by the pandemic in the 1980s. From 2002 to 2004, he was an African President-in-Residence at the African Presidential Archives and Research Center at Boston University. Recently,Template:When he was seen in attendance at an episode of Dancing with the Stars; Kaunda is an avid ballroom dancer. President Michael Sata made use of Kaunda as a roving ambassador for Zambia. In February 2014 Kaunda was hospitalized for a fever at Lusaka Trust Hospital. On 19 October 2007 Kaunda was the recipient of the 2007 Ubuntu Award. Zambia Shall Be Free (1962), Heinemann African Writers Series. ↑ An Introduction to African Politics by Alex Thomson. ↑ Kaunda, Kenneth D., and Colin Morris. Kaunda on Violence. London: Collins, 1980. This page was last edited on 11 June 2017, at 07:35.